Sports protective equipment includes equipment or tools used for safety and security of players while playing sports. Sports protective equipment protects players from any kind of injury while playing sports. This equipment is made for different parts of the body. Rise in demand for sports protective equipment is due to increase in demand for sporting goods, rise in penetration of sports in emerging markets, increasing popularity of sports leagues, and economic development. The sports protective equipment market can be segmented based on product, application, and geography. Based on product, the sports protective equipment market can be segmented into hand protection, head protection, lower body protection, and others. The others segment includes protective footwear, leg protection, mouth guards, and eye protection. 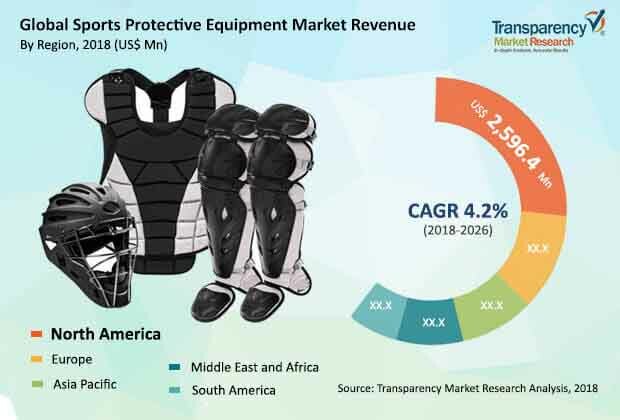 The head protection segment is expected to hold a major market share in the global sports protective equipment market during the forecast period and is estimated to bring in revenues of nearly US$ 2.7 Bn by the end of 2020. Numerous research initiatives are undertaken by various companies worldwide to develop sports protective equipment into more versatile products. More advanced products and awareness among target customers are expected to drive future opportunities in the sports protective equipment market, both in developed and developing nations. Researchers and manufacturers are also trying to design sports protective equipment with essential assistance features such as comfort and light weight with extra protective gear. Therefore, new products are gradually replacing old products, creating a significant opportunity for manufacturers during the forecast period. By product type the market is subdivided into head protection, upper body protection, lower body protection and footwear. In terms of application, the sports protective equipment market can be categorized into water sports and racing, ball games, and mountaineering and rock climbing. Rise in interest and participation in sports activities is resulting the expansion of the market. In addition, rise in consumer awareness related to fitness and health is boosting the demand for sport protective equipment. The global sports protective equipment market is estimated to expand at a significant growth rate between 2018 and 2026 due to strict regulation by sports organizations regarding the use of protective equipment. Several countries across the globe are witnessing a significant demand for new and innovative products as the number of tournaments and sports events held in different countries is increasing. Sports has earned more significance both as an active and inactive source of entertainment. Therefore, consumer expenditure on sports protective equipment and sportswear has increased. Leading sports protective equipment manufacturers are identifying the potential and developing new and innovative products for better safety of players on the field. Through strategic associations and partnerships, sport protective equipment manufacturers are expected to more effectively develop sport services and products, commercialize and access new technologies, distribute and create media advertising, improve marketing and sales activities, expand internationally, and organize customer service. Awareness about health and fitness is increasing. The number of sports tournaments and leagues is also on the rise. This is driving demand for sports protective equipment. Based on geography, the sports protective equipment market can be segmented into North America, Europe, Asia Pacific, Middle East & Africa, and South America. North America held a significant share of the sports protective equipment market as due to rise in awareness about fitness and health and increasein participation of people in sports. Major sports protective equipment market players profiled in the report include Nike Inc., Adidas AG, Puma SE, Asics Corp., Amer Sports Corp., Xenith, Under Armour Inc., McDavid Inc., Mueller Sports Medicine Inc., and Grays International. The sports protective equipment market report provides analysis for the period 2016–2026, wherein the period from 2018 to 2026 is the forecast period and 2017 is the base year. The report covers all the major trends and technologies playing a key role in sports protective equipment market growth over the forecast period. It also highlights the drivers, restraints, and opportunities expected to influence market’s growth during the said period. The study provides a holistic perspective on the sports protective equipment market’s growth throughout the above mentioned forecast period in terms of revenue and volume in (US$ Mn & Mn units), across different geographies, including Asia Pacific, South America, North America, Europe, and Middle East & Africa (MEA). The market overview section of the report demonstrates the market dynamics and trends, such as the drivers, restraints, and opportunities that influence the current nature and future status of this market. An attractiveness analysis has also been provided for every geographic region in the report, in order to provide a thorough analysis of the overall competitive scenario of the sports protective equipment market, globally. Moreover, the report provides an overview of the various strategies of key players present in the market. The product definition and introduction chapters help in understanding different types of sports protective equipment along with its product type and application, which are included in the report. The report segments the global sports protective equipment market based on product, application, and geography. Based on product, the sports protective equipment can be segmented into head protection, upper body protection, lower body protection, and footwear. In terms of application, the sports protective equipment market can be classified into water sports and racing, ball games, mountaineering and rock climbing, and others. Thus, the report provides in-depth cross-segment analysis of the sports protective equipment market and classifies it into various levels, thereby providing valuable insights at the macro as well as micro levels. The report also highlights the competitive landscape of the sports protective equipment market, positioning all the major players according to their geographic presence and recent key developments. The comprehensive sports protective equipment market estimates are a result of our in-depth secondary research, primary interviews, and in-house expert panel reviews. These market estimates have been analyzed by taking into account the impact of different political, social, economic, technological, and legal factors along with the current market dynamics affecting the sports protective equipment market’s growth. The sports protective equipment market in North America is divided into the U.S., Canada, and Rest of North America. Similarly, the market in Europe is divided into Germany, the U.K., France, Italy, and Rest of Europe. Asia Pacific has been segmented into China, Japan, India, and Rest of Asia Pacific. Middle East & Africa covers the GCC. South Africa, and Rest of Middle East and Africa. Similarly, the South American region includes Brazil and Rest of South America. This report provides all the essential information required to understand the sports protective equipment and its components. In addition, the report provides insights related to the policies and regulations according to the various geographical regions mentioned above. These policies and regulations directly or indirectly influence the sports protective equipment market. Furthermore, Porter’s Five Forces analysis explains the factors that are currently affecting the sports protective equipment market. This report also provides the value chain analysis for the sports protective equipment that explains the participants of the value chain. The Sports Protective Equipment market is segmented as below.